- "somebody remove me from here." i arrived in the middle of a rock concert! 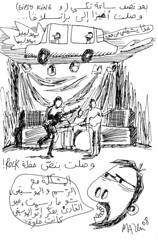 - "the problem with drawing and music, is that whatever you draw, the reader can feel that the music was good..."
man, chou 3am tehkeh? kiss ikht yalli fer2a ma3 ayro modelak!